I try to be a lean thinker and a lean guy. I'm all for reducing and eliminating waste. Where that lines up with the “Green” movement, that's great. “Lean & Green” often line up in ways that are good for the customer, good for the company, and good for the planet. Amazon's “frustration free” packaging is a perfect example of such an effort. One of the types of waste that lean thinkers fight against is the “waste of overproduction” – making stuff that customers don't need or want. When we see huge lots full of cars that were built in excess of demand, the waste is very apparent. A lot of energy was consumed in producing and shipping those cars — and for what reason? Overproduction is wasteful from a corporate standpoint and an environmental standpoint. Even if those cars are eventually sold (at a big discount, bad for the company) the extra energy consumed by moving them around multiple times isn't good. Now, as a blogger, I often get free stuff sent to me. Often, it's spammy, irrelevant emails — not a huge carbon footprint, but it's annoying (no matter how much I chastise the overzealous P.R. people). Worse yet are the physical products that are sent to me. Occasionally, it's a book I'm glad to discover. But, more often, it's something I'm not interested in or don't need. A nameless company (a major one) mailed me some sort of Lean Six Sigma promotional pack to “energize” something or other. The pack included a martial arts black belt (yeah, I now have a black belt), an energy bar and an energy drink. The bar went in the trash, the drink down the sink (with the bottle into the trash) and the black belt sits on my shelf, waiting to be included in a funny picture. A publisher recently mailed me a book called “Green Intelligence.” I have such a stack of books to read, plus this isn't of real great interest to me… so here it sits. It seems neither “Green” nor “intelligent” to ship a book to somebody who didn't ask for it. I would give it away here on the blog, but I'm not keen on spending the $5 to ship it. Now if the publisher had included a $5 UPS gift certificate, I'd feel different. My advice to the P.R. people — before physically sending a product (and consuming your client's resources as well as the planet's), send an email. Pick up the phone and call. Offer the item(s) and then, and only then, ship the actual item in the mail. That book might be perfectly fine, but give me the chance to “pull” the book from you rather than “pushing” it on me. That seems Lean and Green to me. What say you? I agree. If you want to get my attention by sending me something, send me a postcard with a link to a website. Anything more is almost always a waste. I imagine most people with busy careers feel the same way. 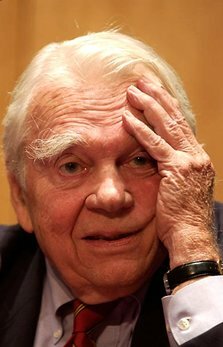 I like the "chanelling my inner Andy Rooney" idea. Even people who try to stay positive need to complain every once in a while! I also agree. As a publisher, we email reviewers about new books, but we only send a review copy when someone replies to the email and requests one. You're dead on, Ralph. Your sense on this is very palatable and practical, and if I were one of your customers I'd welcome and appreciate it. My take on PR/Marketing/Sales over the years is their paradigm is push, not pull. Case in point all the way back to Womack & Jones' Lean Thinking where they pointed out that – what – about 50% of books are shredded without finding a reader? And I will readily admit that one of my personal pet peeves is having something – just about anything – pushed on me – whether it be in lean sense or otherwise. The marketing world could use more of your ilk, Ralph. Interesting to hear folks. As someone who is starting their own design and marketing agency at the beginning of next year, learning how to apply lean thinking within our industry is certainly beneficial to all. Keep up the good work!